child welfare – Don't We Look Alike? 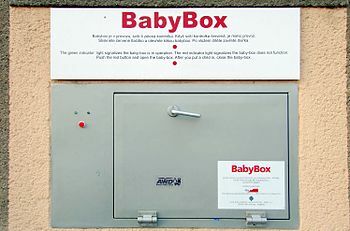 Despite the fact that there was a small, yet diminishing, child abandonment problem for years and the babybox was made in 2009, we heard nothing from the adoption agencies about this until 2012, when their business became more regulated by the Special Adoption Law. Abandonments have risen. This is true. However, abandonments did not rise in a statistically significant way directly following the implementation of the Special Adoption Law. They shot up after legislation was introduced to re-revise the Special Adoption Law and there was high media attention on the box. This began in January 2013. Increase of kids in the babybox, same number as always in the garbage | Tales of Wonderlost. COME TO FIND OUT, THE BABYBOX HAS MADE ITS WAY TO THE CZECH REPUBLIC, TOO. This brief post isn’t about adoption, but it is about children. The welfare of children. Last night I was watching the local Phoenix news, a CBS channel, and my blood started to boil. As a society, we rely on bureaucracies to take care of our at-risk people: children, seniors, and others. I knew CPS wasn’t perfect–that, in fact, it has a lot of flaws. But I hoped that stories of abuse being swept under the rug were mainly confined to old Law & Order episodes. Not so. In Arizona, at least 6,000 (that’s SIX THOUUUUSAND) child abuse reports were never investigated!!! Here’s a link to the article: read it and weep. What has happened to these children? If even 20% of the cases are children in danger, that is at the very least ONE THOUSAND TWO HUNDRED CHILDREN. Budget constraints have been blamed for this, but the truth is it’s up to people who know what is going on to open their mouths at the first sign of trouble. Last January Governor Brewer begged to hire 150-200 EMERGENCY CPS workers. What has happened in the meantime? In my state, the only areas of the government in dire straits like this are the ones related to children, the elderly, the mentally ill, and others who need our help. And CPS is an EMERGENCY division, much like 911. Can we say HELP loud enough to get help for the kids?